What's one everyday habit in your life you'd like to change? Tell us in the comments! You probably know Gretchen Rubin from her megabestsellers The Happiness Project and Happier at Home. With warmth and humor and wisdom that comes from deep research and keen observation, Gretchen Rubin showed us how to get happier – not through some big abstract philosophy, but with practical, small things we can try every day. Now she has turned her attention to habit formation. In Better Than Before, she shows us how to master the habits of our everyday lives. Read It Forward sat down with Gretchen recently to talk with her about her new book. Read It Forward: We loved The Happiness Project and Happier at Home – they’re so helpful! What brought you from happiness to habits? What inspired you to write your new book? 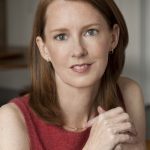 Gretchen Rubin: I was writing and thinking and talking with people about happiness for years, and I began to notice a pattern that often when people talk about a ‘happiness challenge,’ they would talk about some habit that they couldn’t make or break. They knew that they’d be happier if they could go running or get more sleep or work on their novel or give up sugar – they’d figured it out – but for some reason they weren’t able to do it, they weren’t able to follow through. And often that was about a habit that was not forming. So I began to get more and more drawn into thinking about habits. One of the things that was puzzling to me is that there were things that seemed obvious to me (like The Emperor’s New Clothes), but that nobody else ever talked about. No one ever talked about how some people seem to find it much easier to form habits than other people. In all the discussions about habits, it was as if everyone has the same aptitude and attitude toward habits. And there were patterns of habit formation that I wanted to understand better. It really turned into an obsession when a friends very casually said to me, “When I was in high school I was on the track team, and I never missed track practice. But I can’t go running now.” To me, this was intensely interesting because it was the same person, it was the same habit. At one point in her life, she’d formed this habit effortlessly, and now she couldn’t. She’d been really frustrated for years about her inability to form this habit. So what was the explanation for that? I became obsessed. I realized this is my book, this is my topic, I have to crack the code, I have to understand this. I found that so many experts were giving one solution: “Do it first thing in the morning. Start small, Build in moderation.” There were these “answers” that kind of worked for some but for some people they didn’t work or were counterproductive. RIF: Your book is fresh in so many ways. The thing that’s going to make it really work for your readers is that you’ve created a custom-tailored way of applying your tips. The Four Tendencies provide unique solutions for all different types of people. GR: I’m so glad that you think that! That’s definitely what I was trying to emphasize over and over – that there’s no one truth, there’s no one right answer. People want there to be the one-size-fits-all Cinderella solution. I wish that I could figure that out! But I’m so happy that’s what you took from it – that it’s really about figuring out who you are and what will allow you to succeed given everything that’s true about you and what you want to achieve. Take Gretchen Rubin’s Quiz: The Four Tendencies (Upholder, Questioner, Rebel, Obliger) and discover how you respond to expectations – knowing that is key if you want to transform your habits. Congrats to Jaime G., Louisa B., Amy F., Amber C., Trisha M. and 195 other members of the Read It Forward community! 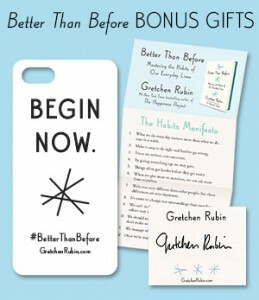 Their entries were selected at random to win an Advance Reader’s Copy of Better Than Before by Gretchen Rubin. GRETCHEN RUBIN is one of the most thought-provoking and influential writers on the linked subjects of habits, happiness, and human nature. She’s the author of many books, including the blockbuster New York Times bestsellers,Happier at Home and The Happiness Project. Rubin has an enormous following, in print and online; her books have sold more than two million copies worldwide, in more than thirty languages, and on her popular daily blog, gretchenrubin.com, she reports on her adventures in pursuit of habits and happiness. Rubin started her career in law, and was clerking for Justice Sandra Day O'Connor when she realized she wanted to be a writer. She lives in New York City with her husband and two daughters. Visit her online - and get tons of free downloadable content from Better Than Before - at GretchenRubin.com. GRETCHEN RUBIN is one of the most thought-provoking and influential writers on the linked subjects of habits, happiness, and human nature. She’s the author of many books, including the blockbuster New York Times bestsellers,Happier at Home and The Happiness Project. Rubin has an enormous following, in print and online; her books have sold more than two million copies worldwide, in more than thirty languages, and on her popular daily blog, gretchenrubin.com, she reports on her adventures in pursuit of habits and happiness. Rubin started her career in law, and was clerking for Justice Sandra Day O’Connor when she realized she wanted to be a writer. She lives in New York City with her husband and two daughters. Visit her online – and get tons of free downloadable content from Better Than Before – at GretchenRubin.com.